Oliver and John come to blows when Oliver reveals his reluctance to surrender the mantle of Green Arrow as planned. Meanwhile, Black Siren continues to manipulate Quentin Lance while working for Ricardo Diaz and Curtis's new romance hits a snag when he discovers his new cop boyfriend is strongly against vigilantism. Black Siren - apparent career criminal all her life - keeps the name of Ricardo Diaz saved on her cell phone as "Ricardo Diaz". John's sudden change in attitude does not make one lick of sense. He says it himself in his conversation with Lyla - he has no idea why he is acting the way he is. Stephen Amell and David Ramsey have given some wonderful, understated performances during their time on Arrow. Then there's their Shatner-esque shouting match in this episode building up to their fight. Apparently having Oliver Queen impeached was not part of Diaz's plan, as the impeachment plot is all Black Siren's idea. What then, was the point of everything they've been setting up involving having Oliver Queen put on trial for being The Green Arrow? Emily Bett Rickards does a great job going into "mom mode" and reading Oliver and John the riot act when they are fighting. The sequence in which Green Arrow and Spartan destroy the Vertigo lab is good. There are elements of Dennis O'Neil's run on Green Arrow here, with John's drug use driving a wedge between himself and Oliver in much the same way that Roy Harper's drug use drove a wedge between himself and Oliver Queen. Oliver makes use of a new explosive trick arrow that breaks when shot, releasing several small explosive balls like buckshot, that spread out, creating a series of small explosions. Vertigo is flammable in its liquid state. Dinah's Canary Cry is revealed to be strong enough to break through a solid wall, as she clears a path for herself and the cops to escape from Diaz' ambush. John: The city needs the mayor now more than it ever did! Oliver: (clearing his throat) It also needs The Green Arrow. John: And that's not me anymore? Oliver: I've been waiting for the right moment... the appropriate moment to tell you. I'm not giving up the hood. John: I guess I should have taken the hint the way you kept putting me off, right? Oliver: You know, John - this team? This mission? It's all of us. You helped build it. I don't understand why it matters what somebody is wearing. John: ... I guess it doesn't. Felicity: That's the moment you were waiting for? That one? Oliver: At least now he knows. (sighs) John's an adult, Felicity. He'll be fine. Diaz: You didn't want to torture him a bit? Maybe slit his throat? Whatever happened to all that Russian vengeance I've heard so much about? Anatoly: (gestures to his clothing) Is new suit! Oliver: John is not going to get bent out of shape over a uniform. Felicity: ... he's a soldier, Oliver! Oliver: Thank you both for coming. D.A. Armand: I have to say, Mr. Mayor, I'm more than a little uncomfortable meeting with you without your attorney present. Oliver: (grinning wickedly) Well, it's not about the case, Sam. It's about the two of you working for Ricardo Diaz. D.A. Armand: The idea of you protecting anyone is a joke! The whole force is under Diaz's thumb! (sarcastically) Or were you offering your protection as The Green Arrow? 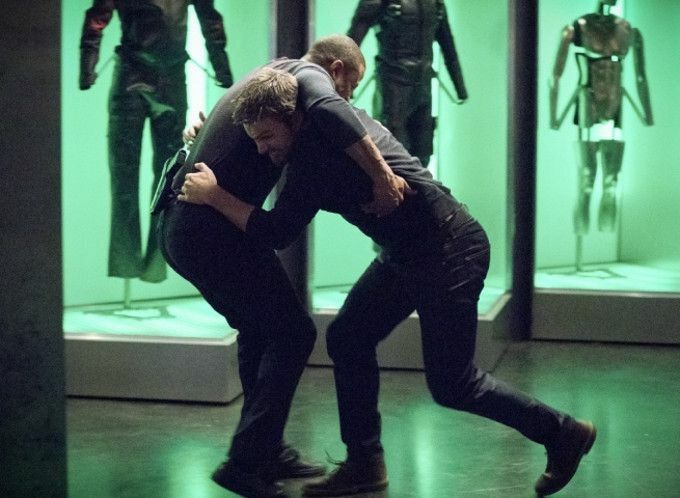 Oliver: (quietly) If I was The Green Arrow, I don't think you'd want to be in this room right now. John: Truth is, Oliver, you have become a better man, but with your focus split, a worse leader. The Green Arrow allows you to become the best version of yourself, and I respect that. I respect you. But if I'm gonna be the best version of myself... Oliver... it can't be with you. Ollie: John, what's going on with you? First you were mad at me because you're not The Green Arrow. And that is - that is - that is WAY out of character for you, my friend. Diaz: Don't waste your time. People like us don't learn the law. People like us - we are the law. The Orchid Bay Night Market runs three-blocks, east-west, along Arguelo Street. Anatoly has being using an alley there as a drop point. Dinah only knows seven cops in all of the SCPD she is certain aren't dirty. Curtis is still taking care of Zoe. D.A. Armand dismisses the charges against Anatoly due to their not being a warrant for his arrest issued when Dinah's team of cops caught him. This causes Dinah and Oliver to figure out that Armand is also working for Ricardo Diaz. The first cop Diaz and Anatoly kill personally is Martain Hurst - a six-year veteran of the SCPD. Curtis determined that Diaz's Vertigo operation is making over one million dollars a day. Curtis has been on three dates with Nick Anastas since 616. Captain Hill reveals that she got an e-mail showing that her family was under surveillance the day after she was promoted. D.A. Armand's son has Stage IV leukemia and even with the city's health insurance plan,he can't afford the treatments without Diaz's money. Oliver fires both Captain Hill and D.A. Armand. Black Siren has never had a real job in her life and isn't even sure how to write a resume. Quentin has kept a hold of all of Laurel's textbooks when she went to law school. Black Siren is still keeping in touch with Ricardo Diaz by text. One of Ricardo Diaz's suppliers is a man named Marshall Katz. Katz is killed by his lady friend, who it turns out is in the employ of Diaz. Black Siren is fully recovered from her injuries 614. Lyla just now found the gift John brought to her office back in 609. She also found how he hacked her computer in order to steal the nano-aluminum amplifier. Lyla suggests that the reason John is upset about not being Green Arrow is that he thinks that all the bad things that happened wouldn't have happened if he hadn't had to step down due to his nerve trouble. One of Dinah's clean cops turns out to be dirty and shoots Curtis. He also told Diaz about where Dinah was hiding the clean cops. Nick Anastas discovers that Curtis is Mister Terrific after he opens Curtis' shirt to find he's wearing his Mister Terrific armor underneath... and when the T-spheres move to help protect them. Captain Hill fired Dinah, Nick and every cop that wasn't on Diaz's payroll before clearing out her desk. Nick is unsure how he feels about vigilantes but does know how he feels about Curtis. Lyla offers John a job working with ARGUS. Armanda and Hill call a press conference claiming to have been fired by Oliver Queen as an effort to stonewall the investigation into his being Green Arrow. They say that this is an impeachable offense that can drive him from office. Black Siren apparently had the idea to try and get Oliver impeached from studying Laurel's law books. It is confirmed that Diaz and Black Siren are lovers and that she is done pretending to be Laurel Lance. You know we're in for a bad time when half the dialogue seems to be the actors complaining about how terrible the writing is. I honestly don't know how this show got renewed for a seventh season at this point. The trailer for next week looks even worse, somehow, with Felicity - who ended this episode telling Oliver she'll stay with him forever, suddenly saying they need some time apart.